BANGKOK, 3 August 2011– The Ministry of Commerce is pressing ahead with its plan to link fruit markets across the country while expanding export markets in the ASEAN region in order to solve low fruit prices due to oversupplies. 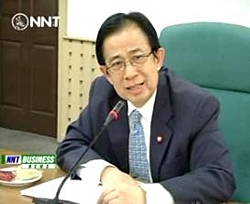 Permanent Secretary for Commerce Yanyong Phuangrach expressed his confidence that fruit prices in general this year will be higher than last year thanks to cooperation among public organisations to increase Thai fruit prices, especially longan, durian and lychee. Average longan price is at 33 baht a kilogram despite its large supplies of over 620,000 tons, higher than last year’s price of 27-28 baht a kilogram, and about 80-90% of longan produce is exported. Lychee price is at 27 baht a kilogram despite its large supplies of 37,000 tons. Provincial commerce offices have successfully linked some fruit markets in order to disseminate the surplus produce and enable fruit prices this year to increase. The ministry hence will expand the link to cover all parts of the country. In addition, the ministry will export more fruits to ASEAN nations following the rising demand in the past two years because of the delicious taste and freshness of Thai fruits. The ministry at the same time will campaign for greater consumption of Thai fruits among Thai people.